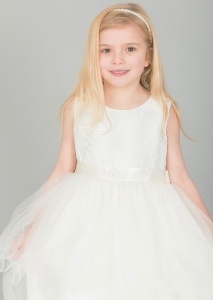 Girls ivory embroidered floral tulle dress, the perfect christening dress or flower girl dress. Dress: This ivory dress has a fully lined bodice with an organza overlay embroidered with a floral design. A satin sash is to the waist with individual petal flowers embedded with faux pearls, beautifully ties around the back into a bow. This dress is sleeveless with a discreet zip fastening at the back. Triple-layered overskirts for fullness - two layers of fluttered net tulle with a satin and net underlay. Fitted lovely- my daughter looked beautiful in this dress.